Your Personal Gardener provides complete lawn care service. We take great pride in making your lawn look its best. We offer full seasonal care for your lawn beginning in spring and continuing through the fall. Every visit includes a complete mowing of all the property, including string trimming around all edges. Removal includes all grass debris on driveways, sidewalks, patios, with a power blower. All lawn debris such as large sticks and branches, cans, papers, trash will be removed. We offer a complete fertilizing program to work specifically with your individual needs. All fertilizing programs are created individually for each client through a turf management specialist assuring you are getting the best product for your lawn. Granular and liquid weed applications are two options available that allow you to complete your lawn care goals. Slit over-seeding is a common way to economically renew and rejuvenate an older or patchy lawn by providing newly seeded grass. This technique is commonly used in the spring and fall when optimal grass growing conditions are present, thus not requiring personal watering. Core aeration is often used in conjunction with slit over-seeding. The process of core aeration is used to cut through thatch and compacted soil allowing for relief of soil compaction, increase in water drainage, aeration to lawn, reduction in thatch layers, and a recycling of nutrients for you grass. The most economical and common means of grass installation. Through the use of seed installation, individuals on a budget or a large scale area can afford a new lawn. Once we determine your local conditions YPG can help you select plan to give you the lawn you deserve. Through the use of soil top dressing and reseeding or sod installation, areas destroyed through high traffic can be brought back to look great. A way for our customers to enjoy the benefits of a fully established lawn overnight. 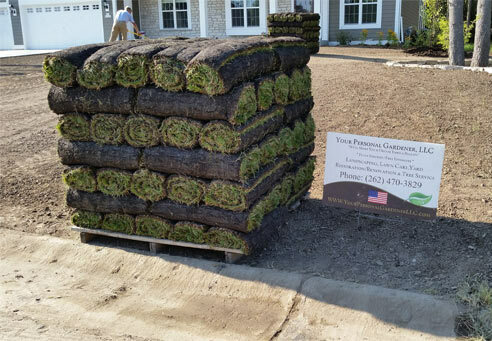 There are many choices available to choose from with sod. Once we determine your local conditions, YPG can help you select the best type for your property. From clover mixtures to full sun Kentucky blue, we will make sure to install the best product for your landscape! Through the use of soil top dressing and reseeding or sod installation, areas destroyed through high traffic can be brought back to look great. Results typically take 2-3 weeks to come back and can tell you a great deal of information as to what your lawn and garden needs to look its best. The soil test can also help aid in what plants may be best suitable for your lawn and landscape. Yard and garden soil test results are typically good for 3-5 years.